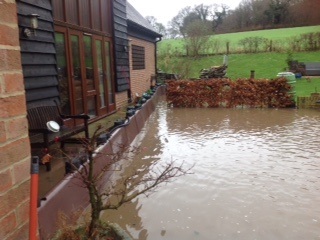 We worked with Mr Hancock in 2014 when he had perceived a surface water flood risk at his domestic property. Having supplied us with photos and measurements of the doorways he wished to protect we produced a deployment plan for him. The plan consisted of a scaled drawing showing exactly where and how many flood units would be required to protect the property from flooding. We were also asked to supply the system in a colour that was more in keeping with a domestic setting. As such the flood barriers were supplied in a subtle brown. The system is simply stacked away in the garage when not in use. We are in the business of protecting people from the heartache of flooding and it is always great to get positive feedback like this. To view more testimonials please see our Case Studies page.